The United States was the home of Carnival Glass. It was developed there, and though other countries soon began to produce their own versions, most collectors today begin with American glass as it is the easiest to obtain. A previous article described the manufacture and appearance of this beautiful product, but briefly, it is a living glass – vibrant and bright – which reflects colour rather like spilt oil on water. 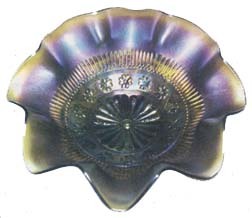 Although the patterns are formed in a mould, unlike pressed glass Carnival Glass needs a lot of hand- finishing and decorating, and the iridescence (created by adding metallic oxides to the hot glass) means that the finished product doesn’t have that somewhat flat appearance often noticed in pressed glass. Pictured left is a Northwood fruit and flowers electric cable ice blue small bowl. Carnival Glass didn’t really become of interest to collectors until the late 1950s, and consequently the history of many of the early companies is still not fully-researched, so many dates are vague. A trawl through textbooks throws up a variety of dates – it seems that no-one is absolutely certain when the various manufacturers first developed their Carnival Glass products, though it is known that by 1905 the first cheap, iridised glass to rival the expensive Tiffany’s was in production. Pictured right is a Noryhwood Rosette rare green bowl. The Northwood Glass Company was founded by English-born Harry Northwood, son of a talented glass manufacturer. Harry left England to work in America in 1880, when he was twenty years old, and founded his own factory in 1887 in Ohio, before eventually moving to Wheeling, West Virginia. Many people believe that it was Harry who brought the technique of iridisation to the USA, having seen it at his father’s glassworks. 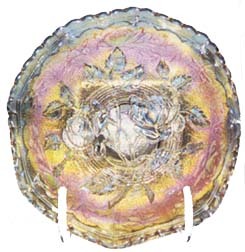 By 1908 he was producing a range of iridised glass, using moulds from earlier pressed glass. He began by making a range of marigold Carnival Glass, which he called ‘Golden Iris’. Iris is from the Greek word for rainbow, and Harry thought that this was a good name for a glass which seemed to contain and reflect so many colours. 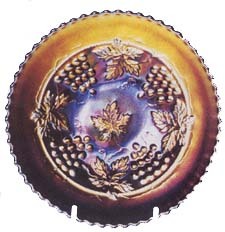 Pictured left is a Northwood grape and cable plate..
Northwood proved to be a very productive factory, introducing designs such as grape and cable, fine cut and rose, beaded cable, wild rose, singing birds, peacock at the fountain, leaf and beads, nippon and rosette. 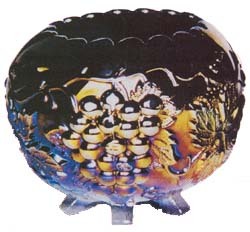 Of all its designs, grape and cable was the most popular, and at one time could be obtained in over seventy shapes of dishes, vases, plates and bowls. Other companies, noting the popularity, copied the designs, which seemed to be quite a common practice at the time. Harry Northwood also introduced some lovely pastel carnival glass, which came in delicate shades of ice blue, ice green and white. Today, the pastels are highly sought after but are quite rare. White is perhaps the easiest to find and is very pretty with a delicate pearly sheen. Later, in 1915, a range of iridised custard glass appeared. This opaque and cream coloured glass has a pastel iridescent overlay, and is now very rare, commanding high prices. Most Carnival Glass is unmarked, but the Northwood company regularly marked their products with a letter ‘N’ in a circle, which makes them easily identifiable even by novice collectors. For a round ten years the Company was at the forefront of the Carnival Glass industry, but then, sadly, Harry contracted a fatal disease. He died in 1918, and without him the company seemed to lose direction, finally foundering to a halt in 1925. Harry Northwood at one time leased the Dugan Glass Company (when under a different name), and was related to Thomas Dugan, one of the managers. When Harry left, the name was changed to Dugan, and in 1910 the company began to produce Carnival Glass, often using old Northwood moulds. Normally it marked its pieces with a ‘D’ set inside a diamond shape, which is probably why, in 1913, it again changed its name, this time to the Diamond Glass Company. Based in Indiana Pennsylvania, Dugan was responsible for many wonderful pieces of iridescent glass with opalescent edges, using patterns such as fan, cherry, apple blossom twigs, butterfly and tulip, farmyard, fishnet, starfish stippled, pastel swans, raindrops and heavy grape. This company continued production right up until 1931, when the factory was destroyed by a disastrous fire. Pictured right is a Dugan grape delight amethyst rosebowl. The Imperial Glass Company, Ohio, was set up in the early 1900s, though the iridised glass didn’t appear till 1910 . Before then, it made pressed glass tumblers, water sets, cruets, pickle trays and other items of table ware. When the company finally introduced its range of Carnival Glass, it was an instant success and huge quantities were manufactured. It was so prolific in its output that most collectors today have some Imperial pieces in their collections. This company decided to specialise in geometric designs rather than the naturalistic patterns favoured by many of the other Carnival Glass companies, and it continued to produce items of practical use as opposed to the more decorative glassware which Northwood, Dugan, Fenton and Millersburg preferred. 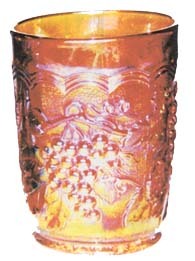 Pictured right is an Imperial grape marigold tumbler. Imperial experimented with many types of glass, often producing unusual base glass colours such as clambroth (a pale ginger-ale) and smoke (light blue-grey). They also managed to achieve an exceptionally brilliant iridescence on their wares, while their purple glass was a very deep, rich shade which no other manufacturer could accomplish. Much of their work resembles the Bohemian glass of the same period. At the time it was apparently quite common for a complete workshop group to decide to emigrate, and Imperial employed many Bohemian German-speaking workers who brought their expertise and ideas with them. The Company also produced a tremendous amount of marigold Carnival Glass, the commonest colour, and so one of the most affordable. Pictured left is an Imperial heavy grape one-handled dish. Glass from Imperial was sold not only in America but also in Europe and Australia, and the Com pany continued to produce items even through the 1930s Great Depression by using earlier moulds to form a cheaper range of pink, blue and green items, now referred to as ‘Depression Glass’. 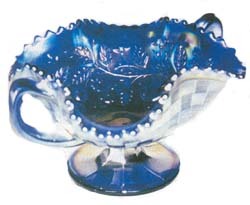 When collectors began to show interest in Carnival Glass nearly forty years ago, Imperial started to produce it once more – and this reproduction ware is now also very collectable, as the company finally ground to a halt in the early 1980s. Pictured right is an Imperial clambroth open rose plate.